It's 76 degrees outside, and this ski banner of mine has got to go! I'm working on it, but the next one will almost certainly be temporary. I really want something that's permanent but need to find a little more time and inspiration for it. Any suggestions? So we had a terrific time shopping the garment district on Saturday. Our most popular stop was clearly my beloved Tinsel Trading, where we managed to spend almost our entire afternoon scouting for amazing little trinkets and vintage trims, but the fabric stores were also very well-received. We had lots of fun getting to know each other while we enjoyed our delicious brunch. And what beautiful weather! Let's do it again soon, everyone. My sister described this toy to me about a month ago. She was trying to buy it for Tsia's birthday and wasn't having any luck finding it at any of the fantastic toy shops in her neighborhood. And then--surprise!--Tsia and I came across it at our local resale shop. I couldn't believe my luck, I love it so much! And at four dollars? What crazy sort of pricing scheme is that, when I'm usually shocked at he ridiculous prices being charged for three-year-old Old Navy styles? But was my sister really planning to buy this for Tsia, or was it secretly for me? I don't know, but I like it even better than Fashion Plates, if you remember that toy. 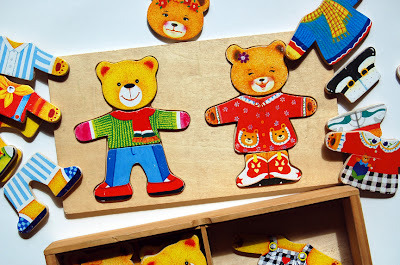 I'm thinking that in a few years we can start creating our own clothes for the bears, tracing the clothing outlines onto mat board or foam core and cutting them out ourselves. They won't have the durability of the original wood pieces, but it will be loads of fun to invent clothes they can wear. We have a smaller box that is just the boy bear here in OZ. The kids (6, 4, and 1) all love it. I loved fashion plates. Loved. Them. Played with them all the time. I loved the clicking sound of the plates and the little clip that the black crayon fit into. Those and Spirograph were my go-to toys! I finally made it to the Tinsel Trading site and I'm so glad you mentioned it on your blog. I've been working on some knitting patterns that absolutely need the vintage bucklets and leather buttons for sale there! What a great shop! I'm glad I read you blog for that great discovery. 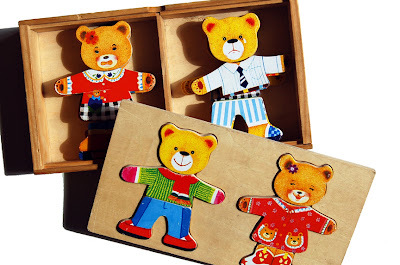 We have the bears puzzle but we have Mummy, Daddy, sister and brother bear! It has been well played with by both my two. i clicked on the tinsel trading link... then i had to quickly click away :) looks like it would be so much fun in person... i'm glad your tour was a success! Oh Rachel and Amisha, beware! If you ever go to the store in person, be prepared to spend hours. HOURS! Nicki, a whole family must be so cute! i love the grumpy bear face! I could cut out some of these shapes out of thin plywood if you would like and we could maybe do a little swap. I would need the patterns...but I have a scroll saw and would be happy to make some extra blank pieces for you. let me know if that is something you are intersted in.